Southern BBQ 2 doors from our apartment? DUH. The Cardinal has a great atmosphere. The hip clientele and simple decor of what could be someone’s most prized thrift store finds fits the laid back, trendy mish-mosh of the East Village perfectly. I didn’t mind waiting 15 minutes on a Friday at 8 for a table for 2. The first surprise I noticed was that there is a downstairs making the restaurant more spacious than it looks from the sidewalk. The staff has that southern charm inviting you to sit back and stuff your face like no one is watching. We peeked at the menu ahead of time so we already knew we wanted to split the BBQ plate. 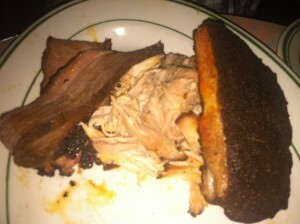 Having a choice of 4 meats, we ordered ribs, pulled pork and brisket. Here is where I had my only issue with this restaurant. The waiter told us there would be a $5 plate splitting fee when he realized we wanted to share. Let’s be real. The charge wasn’t even what irritated me. The fact that we were caught off guard with this charge is what did it for me. Even if we knew there was a splitting fee (which can honestly bite me), we would have ordered the same meal. A little asterisk on the menu would have sufficed. Since we already had to pay a fee, the waiter suggested ordering a salad to help balance the meal. Ahh, the upsell. A little thrown off my game, I was having a hard time deciding between their 2 salads. 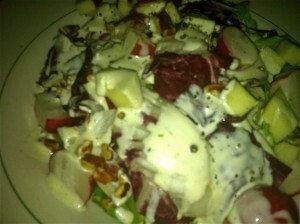 He eventually chose the radicchio, bibb lettuce, radish, apple and pecan with buttermilk dressing for us. And I wasn’t let down. The salad was delicious and a great balance to the meal, just as he said. Our meat plate arrived and was also tasty. It was a toss up between the juicy brisket and the perfectly seasoned ribs for me. I didn’t even feel the need to add one of their specialty sauces (a vinegar, mustard and BBQ) to the ribs. The pulled pork was a little dry but nothing a solid dousing of BBQ sauce couldn’t fix. 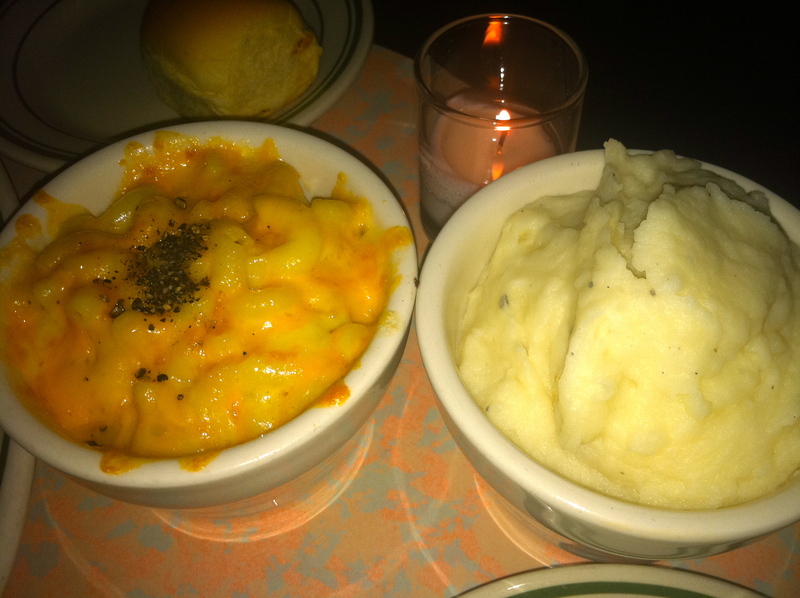 We narrowed down the overwhelming amount of side options to mac and cheese (wonderfully gooey and cheesy) and mashed potatoes (solid but nothing special). 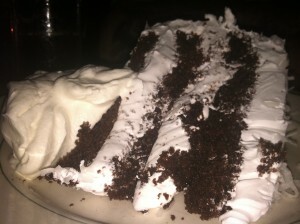 Our waiter convinced us to order a slice of chocolate coconut cake that had just come in that morning. That mesmerizing southern charm! His recommendation didn’t fail us. SO GOOD. Still to try – Brunch (incl. unlimited mimosas for $5), fried chicken and smothered pork chops. Stay up to date with their specials here.